How do I delete an auction? Knowledge Base > Auction How-To’s > How do I delete an auction? To completely delete an auction from inside your account, you will need to first “Archive” the auction. Once an auction is Archived, you will see an option to delete the auction. 1) From the “Manage Auctions” page, click the green plus sign to show the sub options. 2) Once the auction is Archived, you will see a new option to “Delete Auction”. 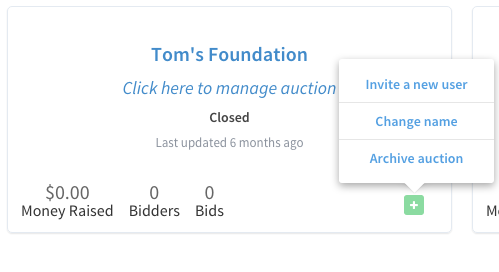 3) Click on “Delete Auction” to completely remove the auction and all the data associated with the auction.